These are two pin jumpers (also called shunts) that will create an electrical connection for the 2.54 mm (0.1 inch) male Pin headers. Commonly used to modify settings on a board or device. Mother board jumper is a manual switch on the motherboard, Through the jumper cap connected to different jumpers PIN, You can change the motherboard circuit. 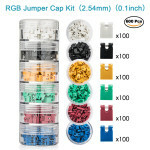 The most common motherboard jumpers are mainly two, One is only two needles, The other part is jumper cap. Jumper cap, Which is an active part, The outer layer is insulated plastic, The inner conductive material can be inserted in the jumper pin above the two jumper pin connected. When the jumper cap is fastened to the two jumper pins, It is on and current is passing through, Which we call ON. On the contrary do not buckle jumper cap, It means is disconnected, Call it OFF.